Heat oven to 375°F. Line 12 medium muffin cups with paper baking cups (or spray cups with cooking spray or grease with shortening). In large bowl, stir together 1/2 cup sugar, the oil, egg and almond extract. Beat in sour cream and milk with spoon until blended. Stir in flour, baking powder, salt, baking soda and poppy seed until well blended. Divide batter evenly among muffin cups. Sprinkle batter with 3 teaspoons sugar and the almonds. Bake 14 to 17 minutes or until toothpick inserted in center comes out clean. Remove from pan to wire rack. Serve warm or cool. You can make the batter the night before, cover the bowl and put it in the fridge. 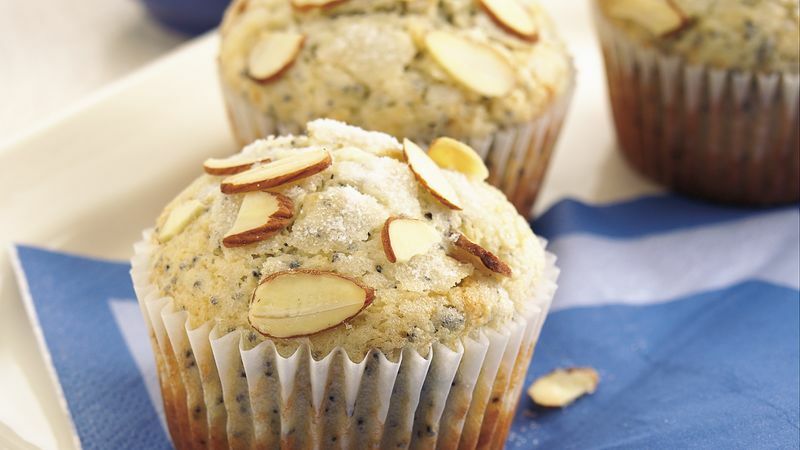 Pop the muffins in the oven to bake just as your guests arrive. Bake at 375°F for 16 to 18 minutes or until golden brown. Add a gourmet touch by making a glaze with 1/2 cup powdered sugar and 2 to 3 teaspoons milk. Use a spoon to drizzle the glaze over the muffins.